Buying or selling a home is stressful enough without worrying about the difference between assessments, appraisals and CMAs. One might think these terms are synonymous, but they’re not. In fact, they are very different. Let’s have a look at the distinction and clear up some confusion among these three terms. A home appraisal is created by a licensed real estate appraiser to give an unbiased evaluation of a home’s value. This is used to set a fair market value on the home. This is different from a Comparative Market Analysis (CMA), which is provided by a real estate agent. For financing purposes, appraisals are used–not the tax assessment or CMA. Recent sales data and knowledge of the local market are factored into the CMA which helps determines the value. The real estate agent then compares the property to similar homes in the area and provides a biased evaluation, in favor of the seller. A tax assessment is set by the city or town. Your taxes are used to pay for local government, public safety, general infrastructure, public schools and libraries. Local governments may update assessments when market conditions or revenue need to change. The tax assessment is based on average market values. The data gathered to estimate the value of your home that you plan to sell in 2016 is based on sales from 2014. So the tax assessment is based on data that’s two years old. That delay in data is why your assed value is showing a lower number than what your appraiser determines. OK, so now that we’ve got that part out of the way, here’s another point of confusion: the tax assessment for Fiscal Year 2016 runs from July 1, 2015 through June 30, 2016. As the climate of the real estate market changes and rates begin to rise again, the tax assessment may start catching up to the appraised value. If you’re thinking about buying a new home, this may be the best time to make the investment and secure a mortgage at a low rate. I hope this clarification helps clear up the confusion. Need more help selling your old home and buying a new one? Please get in touch and I’ll be happy to help guide you through the process and answer your questions. I look forward to helping you. Trick-or-Treat! What Should Kids Eat? 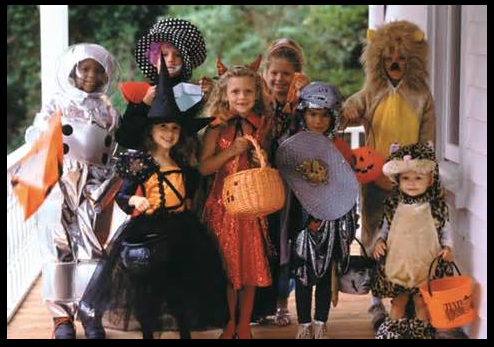 If you’re a Halloween traditionalist, you’ll expect your kids to finish making the rounds in the neighborhood with a bag filled with chocolate bars, candy, bubble gum and other sweet treats. You’ll also expect them to over-indulge in their plunder until they either reach a frenzied sugar high or they just make themselves sick. That, unfortunately, is the secret trick hidden in the treats. So how do you temper the sugar rush with something that won’t spike their insulin levels to unnatural highs — without being the family that gives out boring treats? Here are some suggestions. 1. Packaged Foods. Almonds, peanuts and others (ask if allergic before handing out). Mini raisin boxes. Packaged crackers and cheese. Granola and breakfast bars. Juice boxes and fruit rollups (with real fruit). 2. Art Supplies. Crayons and coloring books, stickers, colored pencils, character-shaped erasers, stamps (not postage! ), mini colored markers. 3. Toys and Fun Stuff. Snap bracelets, trading cards, bubbles, silly putty, fake eyeballs, spiders, bats, slime and other spooky stuff. Rubber balls, wax vampire teeth, yo-yos and wind-up toys.